and even BIGGER than last year.! Come enjoy your holidays with CanadianDollarBingo and win over $30,000 in GUARANTEED cash and prizes. Our special 12 Days of Christmas patterns will play December 20th - 31st in our Main room. 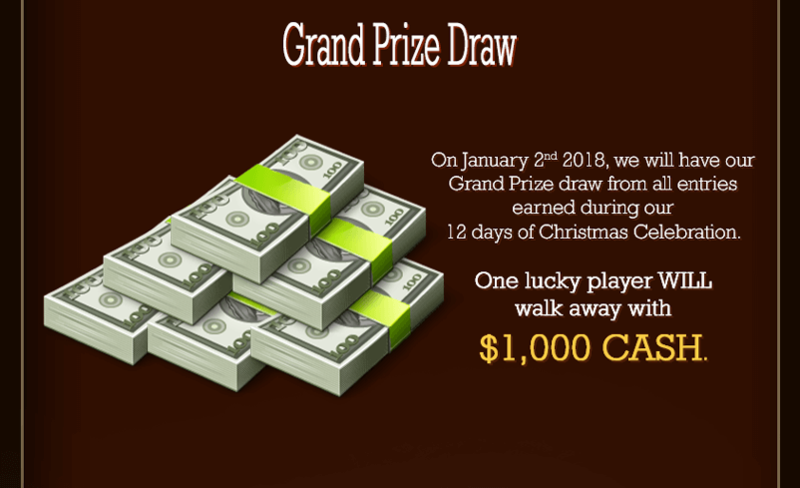 In addition to our special Christmas patterns, every day during our contest will give one lucky player a chance to shake our Christmas tree filled with additional cash and prizes. game patterns and you´re on your way to winning. Ginger Bread, Poinsettia, Ginger Bread/Sugar Cookie. CanadianDollarBingo’s 12 Days of Christmas run from December 20th – December 31st, 2017. Players must have deposited in the last 7 days to participate in our 12 days of Christmas Contest. A flowback from a pending payout will qualify as a deposit. The value of each prize will be determined by our online supplier. Should the prize shown not be available a similar prize or cash value will be offered by the BingoAffiliates.com. Our special 12 days of Christmas patterns will play twice per hour 24/7 each contest day. Pre-Buys will be available for our special 12 days of Christmas patterns. Every Contest Pattern won between December 20th and December 31st will be automatically entered into our Grand Prize Draw. Grand Prize CA$H winner will be selected at random January 2nd, 2018 and posted on our contest page. Grand Prize Winner needs to provide us a video testimonial as a requirement to receive the prize.